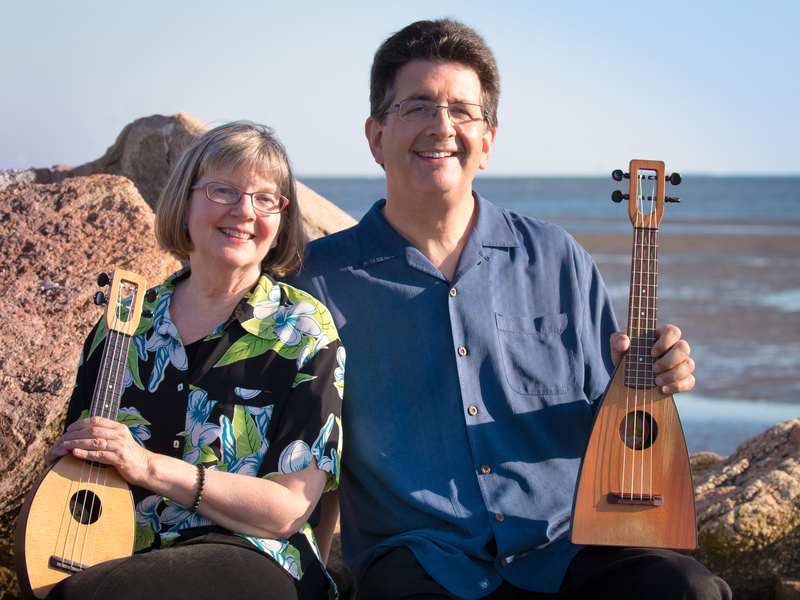 Jumpin’ Jim Beloff & Liz Beloff Ukulele Workshop & Concert! Yup, they’re here! The authors of what we all refer to as your “Yellow Book” & “Blue Book”, titled The Daily Ukulele: 365 Songs For Better Living & The Daily Ukulele: Leap Year Edition, two of the biggest & best-selling ukulele songbooks ever published. For those who know a handful of chords & a basic up-down strum, here’s a chance to take your skills to a new level. A dozen or so well-known songs will be played while learning more chords, new fingerings, new strums, a picking pattern, transposing on the fly, & performance tips & techniques along the way. All music will be from the Jumpin’ Jim’s books arranged by Jim Beloff, Lyle Ritz, Fred Sokolow, Tony Mizen & James Hill. If you have the books, please bring them. As performers, Jim & Liz Beloff have become known for their breezy, close harmonies on standards & Jim’s original songs. They perform together regularly throughout the USA, playing their family-made Fluke, Flea & Firefly Ukuleles. They’ve also toured Japan, Australia & Canada, & believe in their company’s motto, Uke Can Change the World. Finding a ukulele at the Pasadena Rose Bowl Flea Market in 1992 inspired Liz & Jim Beloff to start Flea Market Music, Inc., publisher of the popular Jumpin’ Jim’s ukulele songbooks. Sold worldwide, the series includes The Daily Ukulele: 365 Songs For Better Living & The Daily Ukulele: Leap Year Edition, two of the biggest & best-selling ukulele songbooks ever published. Jim Beloff is the author of The Ukulele: A Visual History (Backbeat Books), producer of Legends of Ukulele, a CD compilation for Rhino Records, & has made 3 how-to-play DVDs for Homespun. Jim is also an active songwriter. His 2014 two-CD set, Dreams I Left In Pockets, features 33 songs he wrote or co-wrote with uke legends Herb “Ohta-san” Ohta & Lyle Ritz. In 1999, Jim composed & premiered Uke Can’t Be Serious, a concerto for solo ukulele & symphony orchestra. The piece has been performed many times, most recently in 2016 with the Choate School orchestra in Germany & Austria, also with the Michigan Philharmonic. In 2017, Jim premiered a new work entitled The Dovetale commissioned & performed by the Wallingford (CT) Symphony Orchestra. Liz Maihock Beloff, with a background in film & television graphics, designs the covers & art-directs all of Flea Market Music’s songbooks, CDs & DVDs. She’s also a talented singer who, before teaming up with Jim, sang with a cappella groups in college & New York City. Call 941-966-5800 to reserve your seat!